Ash-irisarri, Kate Atkin, Tamara Baden-Daintree, Anne Bennett, Alastair Black, Daisy Dow, Anna Flannery, Mary C Grossman, Joel Howes, Harriet Kobayashi, Yoshiko Madrinkian, Michael O’byrne, Theresa Pattwell, Niamh Perry, R D and Sawyer, Daniel 2018. IIIMiddle English. The Year's Work in English Studies, Vol. 97, Issue. 1, p. 214. Lacey, Eric Symons, Victoria and Thomson, Simon 2018. IIOld English. The Year's Work in English Studies, Vol. 97, Issue. 1, p. 187. Myklebust, Nicholas 2017. The Palgrave Handbook of Affect Studies and Textual Criticism. p. 577. Pascual, Rafael J. 2017. Oral Tradition and the History of English Alliterative Verse. Studia Neophilologica, Vol. 89, Issue. 2, p. 250. O’Neil, David 2017. A Syntactic Basis for the Distribution of Metrical Types in Beowulf. The Mediaeval Journal, Vol. 7, Issue. 1, p. 29. Weiskott, Eric 2016. Systematicity, a missing term in historical metrics. Language and Literature, Vol. 25, Issue. 4, p. 328. English Alliterative Verse tells the story of the medieval poetic tradition that includes Beowulf, Piers Plowman, and Sir Gawain and the Green Knight, stretching from the eighth century, when English poetry first appeared in manuscripts, to the sixteenth century, when alliterative poetry ceased to be composed. Eric Weiskott draws on the study of meter to challenge the traditional division of medieval English literary history into Old English and Middle English periods. The two halves of the alliterative tradition, divided by the Norman Conquest of 1066, have been studied separately since the nineteenth century; this book uses the history of metrical form and its cultural meanings to bring the two halves back together. In combining literary history and metrical description into a new kind of history he calls 'verse history', Weiskott reimagines the historical study of poetics. Allen, Hope Emily, ed. English Writings of Richard Rolle, Hermit of Hampole. Oxford: Clarendon Press, 1931. Andrew, Malcolm, and Waldron, Ronald, eds. The Poems of the Pearl Manuscript: “Pearl,” “Cleanness,” “Patience,” “Sir Gawain and the Green Knight” (5th edn.). University of Exeter Press, 2007, repr. 2010. Arngart, O[lof], ed. The Proverbs of Alfred: An Emended Text. Lund: Gleerup, 1978. Barr, Helen, ed. The Piers Plowman Tradition. London: J. M. Dent, 1993. Bawcutt, Priscilla, ed. The Poems of William Dunbar (2 vols.). Glasgow: Association for Scottish Literary Studies, 1998. Benson, Larry D., ed. The Riverside Chaucer (3rd edn.). Boston: Houghton Mifflin, 1987. Brock, Edmund, ed. Morte Arthure, or The Death of Arthur. EETS OS 8, 1871. Brook, G. L., and Leslie, R. F., eds. Laʒamon: “Brut” (2 vols.). EETS OS 250 and 277, 1963 and 1978. Brown, Carleton, ed. English Lyrics of the XIIIth Century. Oxford: Clarendon Press, 1932. Cigman, Gloria, ed. Lollard Sermons. EETS OS 294, 1989. Coxe, H. O., ed. Chronica, siue Flores Historiarum (4 vols.). English Historical Society 8, 1841–44. D’Evelyn, Charlotte, and Mill, Anna J., eds. The South English Legendary: Corpus Christi College Cambridge MS. 145 and British Museum MS. Harley 2277, with Variants from Bodley MSS. Ashmole 43 and British Museum MS. Cotton Julius D.ix. EETS OS 235, 236, and 244, 1956–59. Dickins, Bruce, ed. The Conflict of Wit and Will: Fragments of a Middle English Alliterative Poem. Kendal: Titus Wilson, 1937. Duggan, Hoyt N., and Turville-Petre, Thorlac, eds. The Wars of Alexander. EETS SS 10, 1989. Dumville, David, and Keynes, Simon, gen. eds. The Anglo-Saxon Chronicle: A Collaborative Edition (23 vols.). Cambridge: D. S. Brewer, 1983–. Field, P. J. C., ed. Sir Thomas Malory: Le Morte Darthur (2 vols.). Cambridge: D. S. Brewer, 2013. Fulk, R. D., Bjork, Robert E., and Niles, John D., eds. Klaeber’s Beowulf (4th edn.). University of Toronto Press, 2008. Gollancz, Israel, ed. St. Erkenwald. London: Oxford University Press, 1922. Hall, Joseph, ed. Selections from Early Middle English, 1130–1250 (2 vols.). Oxford: Clarendon Press, 1920. Hanna, Ralph III, ed. The Awntyrs off Arthure at the Terne Wathelyn. Manchester University Press, 1974. Hathaway, E. J., Ricketts, P. T., Robson, C. A., and Wilshere, A. D., eds. Fouke le Fitz Waryn. Oxford: Blackwell, 1975. Holt, Robert, ed. The Ormulum, with nn. and gloss. by White, R. M. (2 vols.). Oxford: Clarendon Press, 1878. Horstmann, Carl, ed. The Early South-English Legendary; or, Lives of Saints. EETS OS 87, 1887. Kane, George, and Donaldson, E. Talbot, eds. Piers Plowman: The B Version. London: Athlone, 1975. Kennedy, Ruth, ed. Three Alliterative Saints’ Hymns: Late Middle English Stanzaic Poems. EETS OS 321, 2003. Krapp, George Philip, and Van Kirk Dobbie, Elliott, eds. The Anglo-Saxon Poetic Records (6 vols.). New York: Columbia University Press, 1931–53. Langlois, Ernest, ed. Le Roman de la Rose par Guillaume de Lorris et Jean de Meun (5 vols.). Paris: Didot/Champion, 1914–24. Love, Rosalind C., ed. and tr. Three Eleventh-Century Anglo-Latin Saints’ Lives: “Vita S. Birini,” “Vita et miracula S. Kenelmi” and “Vita S. Rumwoldi.” Oxford University Press, 1996. Luard, H. R., ed. Mattæi Parisiensis Monachi S. Albani Chronica Maiora (7 vols.). Rolls Series 57, 1872–83. Lumby, J. R., ed. Polychronicon Ranulphi Higden Monachi Cestrensis (9 vols.). Rolls Series 41, 1865–86. Miller, Thomas, ed. and tr. The Old English Version of Bede’s Ecclesiastical History of the English People (4 vols.). EETS OS 95, 96, 110, and 111, 1890–98. Moffat, Douglas, ed. The Soul’s Address to the Body: The Worcester Fragments. East Lansing, MI: Colleagues Press, 1987. Morse, Ruth, ed. St. Erkenwald. Cambridge: D. S. Brewer, 1975. Oakden, J. P., ed. Scotish Ffeilde. Manchester: Chetham Society, 1935. Panton, George A., and Donaldson, David, eds. The “Gest Hystoriale” of the Destruction of Troy: An Alliterative Romance (2 vols.). EETS OS 39 and 53, 1869 and 1874. Rhodes, Neil, Richards, Jennifer, and Marshall, Joseph, eds. King James VI and I: Selected Writings. Aldershot: Ashgate, 2003. Riley, H. T., ed. Gesta Abbatum Monasterii Sancti Albani (3 vols.). Rolls Series 28, 1867–69. Russell, George, and Kane, George, eds. Piers Plowman: The C Version. London: Athlone, 1997. Rychner, Jean, ed. Les lais de Marie de France. Paris: Champion, 1983. Savage, Henry L., ed. St. Erkenwald: A Middle English Poem. New Haven: Yale University Press, 1926. Skeat, W. W., ed. The Romance of William of Palerne. EETS ES 1, 1867. Trigg, Stephanie, ed. Wynnere and Wastoure. EETS OS 297, 1990. Vaughan, R., ed. The Chronicle Attributed to John of Wallingford. Camden Society Third Series 90, 1958. Weiss, Judith, ed. and tr. Wace’s Roman de Brut: A History of the British (2nd edn.). University of Exeter Press, 2002. Wirtjes, Hanneke, ed. The Middle English “Physiologus”. EETS OS 299, 1991. Woodbine, George E., ed. Bracton: De legibus et consuetudinibus Angliæ (4 vols.). New Haven, CT: Yale University Press, 1915–42. Wright, Thomas, ed. The History of Fulk Fitz Warine, an Outlawed Baron in the Reign of King John. London: Warton Club, 1804. Abram, Christopher. “The Errors in The Rhyming Poem.” RES 58 (2007): 1–9. Allen, David G., and White, Robert A., eds. The Work of Dissimilitude: Essays from the Sixth Citadel Conference on Medieval and Renaissance Literature. Newark: University of Delaware Press, 1992. Allen, Rosamund. “Date and Provenance of King Horn: Some Interim Reassessments.” In Medieval English, ed. Kennedy, Waldron, and Wittig, , pp. 99–126. Allen, Rosamund. “‘Nv seið mid loft-songe’: A Reappraisal of Lawman’s Verse Form.” In Laʒamon, ed. Allen, Perry, and Roberts, , pp. 251–82. Allen, Rosamund, Perry, Lucy, and Roberts, Jane, eds. Laʒamon: Contexts, Language, and Interpretation. London: Centre for Late Antique and Medieval Studies, 2002. Allen, Rosamund, Roberts, Jane, and Weinberg, Carole, eds. Reading Laʒamon’s “Brut”: Approaches and Explorations. Amsterdam and New York: Rodopi, 2013. Amos, Ashley Crandell. Linguistic Means of Determining the Dates of Old English Literary Texts. Cambridge, MA: Medieval Academy of America, 1980. Aurell, Martin, ed. Culture politique des Plantagenêt (1154–1224). Poitiers: Centre d’Études Supérieures de Civilisation Médiévale, 2003. Baker, Peter S., ed. The Beowulf Reader. New York: Garland, 1995. Bald, Wolf-Dietrich, and Weinstock, Horst, eds. Medieval Studies Conference Aachen 1983: Language and Literature. Frankfurt: Peter Lang, 1984. Barney, Stephen A. “Langland’s Prosody: The State of Study.” In Endless Knot, ed. Tavormina, and Yeager, , pp. 65–85. Barney, Stephen A. “A Revised Edition of the C Text” [Review of Piers Plowman, ed. Derek Pearsall]. YLS 23 (2009): 265–88. Barr, Helen. Signes and Sothe: Language in the “Piers Plowman” Tradition. Cambridge: D. S. Brewer, 1994. Barron, W. R. J. “Alliterative Romance and the French Tradition.” In Middle English Alliterative Poetry, ed. Lawton, , pp. 70–87. Bately, Janet M. “Linguistic Evidence as a Guide to the Authorship of Old English Verse: A Reappraisal, with Special Reference to Beowulf.” In Learning and Literature, ed. Lapidge, and Gneuss, , pp. 409–31. Battles, Paul. “Toward a Theory of Old English Poetic Genres: Epic, Elegy, Wisdom Poetry, and the ‘Traditional Opening.’” SIP 111 (2014): 1–33. Baugh, Albert C. “The Chronology of French Loan-Words in English.” Modern Language Notes 50 (1935): 90–93. Bawcutt, Priscilla. Dunbar the Makar. Oxford: Clarendon Press, 1992. Bennett, J. A. W. “Survival and Revivals of Alliterative Modes.” LSE 14 (1983): 26–43. Benskin, Michael, and Samuels, M. L., eds. So meny people longages and tonges: Philological Essays in Scots and Mediæval English Presented to Angus McIntosh. Edinburgh, 1981. Benson, C. David, and Blanchfield, Lynne. The Manuscripts of “Piers Plowman”: The B Version. Woodbridge, Suffolk: Boydell & Brewer, 1997. Benson, Larry D. “The Authorship of St. Erkenwald.” JEGP 64 (1965): 393–405. Benson, Larry D., and Wenzel, Siegfried, eds. The Wisdom of Poetry: Essays in Early English Literature in Honor of Morton Bloomfield. Kalamazoo, MI: Medieval Institute, 1982. Bergman, Madeleine M. “Supplement to A Concordance to ‘The Anglo-Saxon Poetic Records’. ” Mediaevalia 8 (1982): 9–52. Bjork, Robert E., ed. Cynewulf: Basic Readings. New York and London: Garland, 1996. Blake, Norman F. “The Dating of Old English Poetry.” In English Miscellany, ed. Lee, , pp. 14–27. Blake, Norman F. “Middle English Alliterative Revivals” [Review of Turville-Petre, Alliterative Revival]. Review 1 (1979): 205–14. Blake, Norman F. “Rhythmical Alliteration.” MP 67 (1969): 118–24. Blanton, Virginia, and Scheck, Helene, eds. Intertexts: Studies in Anglo-Saxon Culture Presented to Paul E. Szarmach. Tempe: Arizona Center for Medieval and Renaissance Studies, 2008. Bliss, Alan J. “Some Unnoticed Lines of Old English Verse.” N&Q 18 (1971): 404. Blurton, Heather, and Wogan-Browne, Jocelyn, eds. Rethinking the “South English Legendaries”. Manchester University Press, 2011. Boffey, Julia, and Edwards, A. S. G.. A New Index of Middle English Verse. London: British Library, 2005. Borroff, Marie. “Narrative Artistry in St. Erkenwald and the Gawain-Group: The Case for Common Authorship Reconsidered.” Studies in the Age of Chaucer 28 (2006): 41–76. Borroff, Marie. “Sir Gawain and the Green Knight”: A Stylistic and Metrical Study. New Haven: Yale University Press, 1962. Bredehoft, Thomas A. “Ælfric and Late Old English Verse.” ASE 33 (2004): 77–107. Bredehoft, Thomas A. Authors, Audiences, and Old English Verse. University of Toronto Press, 2009. Bredehoft, Thomas A. “The Date of Composition of Beowulf and the Evidence of Metrical Evolution.” In Dating, ed. Neidorf, , pp. 97–111. Bredehoft, Thomas A. Early English Metre. University of Toronto Press, 2005. Bredehoft, Thomas A. “OE yðhengest and an Unrecognized Passage of Old English Verse.” N&Q 54 (2007): 120–22. Breeze, Andrew. “New Texts of Index of Middle English Verse 3513.” MÆ 61 (1992): 284–87. Brehe, S. K. “Rhyme and the Alliterative Standard in Laʒamon’s Brut.” Parergon 18 (2000): 11–25. Brehe, S. K. “‘Rhythmical Alliteration’: Ælfric’s Prose and the Origins of Laʒamon’s Metre.” In Text and Tradition, ed. Saux, Le, pp. 65–87. Bryan, Elizabeth J. “Laʒamon’s Brut and the Vernacular Text: Widening the Context.” In Reading, ed. Allen, , Roberts, , and Weinberg, , pp. 661–89. Bryan, Elizabeth J. “The Two Manuscripts of Laʒamon’s Brut: Some Readers in the Margins.” In Text and Tradition, ed. Le Saux, , pp. 89–102. Burrow, J. A. “The Endings of Lines in ‘Piers Plowman’ B.” N&Q 59 (2012): 316–20. Burrow, J. A. “Saint Erkenwald Line 1: ‘At London in Englond.’” N&Q 40 (1993): 22–23. Burrow, J. A. “Winning and Wasting in Wynnere and Wastoure and Piers Plowman.” In Makers and Users, ed. Meale, and Pearsall, , pp. 1–12. Burrow, John A., and Duggan, Hoyt N., eds. Medieval Alliterative Poetry: Essays in Honour of Thorlac Turville-Petre. Dublin: Four Courts, 2010. Busse, Wilhelm. Altenglische Literatur und ihre Geschichte: Zur Kritik des gegenwärtigen Deutungssystems. Düsseldorf: Droste, 1987. Busse, Wilhelm, and Holtei, R.. “Beowulf and the Tenth Century.” Bulletin of the John Rylands University Library 63 (1981): 285–329. Butterfield, Ardis. The Familiar Enemy: Chaucer, Language, and Nation in the Hundred Years’ War. Oxford University Press, 2009. Cable, Thomas. The English Alliterative Tradition. Philadelphia: University of Pennsylvania Press, 1991. Cable, Thomas. “Foreign Influence, Native Continuation, and Metrical Typology in Alliterative Lyrics.” In Approaches, ed. Jefferson, and Putter, , pp. 219–34. Cable, Thomas. “Metrical Style as Evidence for the Date of Beowulf. ” In Dating, ed. Chase, , pp. 77–82. Cable, Thomas. “Progress in Middle English Alliterative Metrics” [Review of Putter, Jefferson, and Stokes, Studies, and Yakovlev, “Development”]. YLS 23 (2009): 243–64. Cameron, Angus F. “Middle English in Old English Manuscripts.” In Chaucer and Middle English, ed. Rowland, , pp. 218–29. Camp, Cynthia Turner. “Spatial Memory, Historiographic Fantasy, and the Touch of the Past in St. Erkenwald.” New Literary History 44 (2013): 471–91. Campbell, Alistair. Old English Grammar. Oxford: Clarendon Press, 1959. Cannon, Christopher. The Grounds of English Literature. Oxford University Press, 2004. Cannon, Christopher. The Making of Chaucer’s English: A Study of Words. Cambridge University Press, 1998. Cannon, Christopher. “The Style and Authorship of the Otho Revision of Layamon’s Brut.” MÆ 62 (1993): 187–209. Carney, Clíodhna, and McCormack, Frances, eds. Chaucer’s Poetry: Words, Authority and Ethics. Dublin: Four Courts, 2013. Cartlidge, Neil. “The Date of The Owl and the Nightingale.” MÆ 65 (1996): 230–47. Chambers, R. W. On the Continuity of English Prose from Alfred to More and His School. EETS OS 191A, 1932. Chase, Colin, ed. The Dating of “Beowulf”. University of Toronto Press, 1981, repr. with an afterword, 1997. Chism, Christine. Alliterative Revivals. Philadelphia: University of Pennsylvania Press, 2002. Clifton, Nicole. “The Romance Convention of the Disguised Duel and the Climax of Piers Plowman.” YLS 7 (1993): 123–28. Cole, Kristin Lynn. “Chaucer’s Metrical Landscape.” In Chaucer’s Poetry, ed. Carney, and McCormack, , pp. 92–106. Cole, Kristin Lynn. “The Destruction of Troy’s Different Rules: The Alliterative Revival and the Alliterative Tradition.” JEGP 109 (2010): 162–76. Cole, Kristin Lynn. “Rum, Ram, Ruf, and Rym: Middle English Alliterative Meters.” Diss., University of Texas at Austin, 2007. Colleer, Claude, ed. The Letters of Gerard Manley Hopkins to Robert Bridges (2nd edn.). Oxford University Press, 1955. Conner, Patrick W. “On Dating Cynewulf.” In Cynewulf, ed. Bjork, , pp. 23–53. Conner, Patrick W. “The Ruthwell Monument Runic Poem in a Tenth-Century Context.” RES 59 (2008): 25–51. Conner, Patrick W. “The Structure of the Exeter Book Codex (Exeter, Cathedral Library, MS. 3501).” Scriptorium 40 (1986): 233–42. Cooper, Helen. “Langland’s and Chaucer’s Prologues.” YLS 1 (1987): 71–81. Cornelius, Ian. “The Accentual Paradigm in Early English Metrics.” JEGP 114 (2015): 459–81. Cornelius, Ian. “Alliterative Revival: Retrospect and Prospect” [Review of Schiff, Revivalist]. YLS 26 (2012): 261–76. Cornelius, Ian. Reconstructing Alliterative Verse: The Pursuit of a Medieval Meter. Cambridge University Press, in press. Cronan, Dennis. “Poetic Words, Conservatism, and the Dating of Old English Poetry.” ASE 33 (2004): 23–50. Curzan, Anne, and Emmons, Kimberly, eds. Studies in the History of the English Language II: Unfolding Conversations. Berlin: Mouton de Gruyter, 2004. Dance, Richard, and Wright, Laura, eds. The Use and Development of Middle English. Frankfurt: Peter Lang, 2013. Davis, Bryan P. “The Prophecies of Piers Plowman in Cambridge University Library MS Gg.4.31.” Journal of the Early Book Society 5 (2002): 15–36. Doane, A. N., and Wolf, Kirsten, eds. Beatus vir: Studies in Early English and Norse Manuscripts in Memory of Phillip Pulsiano. Tempe: Arizona Centre for Medieval and Renaissance Studies, 2006. Dolven, Jeff. “Spenser’s Metrics.” In Oxford Handbook, ed. McCabe, , pp. 385–402. Donoghue, Daniel. “Laʒamon’s Ambivalence.” Speculum 65 (1990): 537–63. Doyle, A. I. “The Manuscripts.” In Middle English Alliterative Poetry, ed. Lawton, , pp. 88–100. Duffell, Martin J. A New History of English Metre. London: Modern Humanities Research Association, 2008. Duggan, Hoyt N. “The End of the Line.” In Medieval Alliterative Poetry, ed. Burrow, and Duggan, , pp. 67–79. Duggan, Hoyt N. “Extended A-Verses in Middle English Alliterative Poetry.” Parergon 18 (2000): 53–76. Duggan, Hoyt N. “Notes toward a Theory of Langland’s Meter.” YLS 1 (1987): 41–70. Duggan, Hoyt N. “Stress Assignment in Middle English Alliterative Poetry.” JEGP 89 (1990): 309–29. Edwards, A. S. G. “The Blage Manuscript and Alliterative Verse in the Sixteenth Century.” In Medieval Alliterative Poetry, ed. Burrow, and Duggan, , pp. 80–84. Edwards, A. S. G. “Editing and Manuscript Form: Middle English Verse Written as Prose.” English Studies in Canada 27 (2001): 15–28. Evans, Ruth. “An Afterword on the Prologue.” In Idea, ed. Wogan-Browne, et al., pp. 371–78. Everett, Dorothy. Essays on Middle English Literature, ed. Kean, Patricia. Oxford: Clarendon Press, 1955. Faulkner, Mark. “Rewriting English Literary History, 1042–1215.” LC 9 (2012): 275–99. Feilitzen, Olof. The Pre-Conquest Personal Names of the Domesday Book. Uppsala: Almqvist & Wiksell, 1937. Fein, Susanna. “Form and Continuity in the Alliterative Tradition: Cruciform Design and Double Birth in Two Stanzaic Poems.” MLQ 53 (1992): 100–125. Fein, Susanna, and Johnston, Michael, eds. Robert Thornton and his Books: Essays on the Lincoln and London Thornton Manuscripts. York Medieval Press, 2014. Fenton, James. An Introduction to English Poetry. London: Penguin, 2002. Field, P. J. C. “Malory’s Sir Phelot and the Problems of Minor Sources.” Bulletin Bibliographique de la Société Internationale Arthurienne 54 (2002): 345–61. Field, Rosalind. “The Anglo-Norman Background to Alliterative Romance.” In Middle English Alliterative Poetry, ed. Lawton, , pp. 54–69. Fletcher, Alan J. “The Genesis of The Owl and the Nightingale: A New Hypothesis.” CR 34 (1999): 1–17. Frank, Roberta. “The Beowulf Poet’s Sense of History.” In Wisdom of Poetry, ed. Benson, and Wenzel, , pp. 53–65. Frank, Roberta. “A Scandal in Toronto: The Dating of ‘Beowulf’ a Quarter Century On.” Speculum 82 (2007): 843–64. Frank, Roberta. “Sharing Words with Beowulf.” In Intertexts, ed. Blanton, and Scheck, , pp. 3–15. Frank, Roberta. “Three ‘Cups’ and a Funeral in Beowulf.” In Latin Learning, ed. O’Brien O’Keeffe, and Orchard, , vol. 2, pp. 407–20. Frantzen, Allen J. “The Form and Function of the Preface in the Poetry and Prose of Alfred’s Reign.” In Alfred the Great, ed. Reuter, , pp. 121–36. Friedlander, Carolynn VanDyke. “Early Middle English Accentual Verse.” MP 76 (1979): 219–30. Fulk, R. D. “Beowulf and Language History.” In Dating, ed. Neidorf, , pp. 19–36. Fulk, R. D. A History of Old English Meter. Philadelphia: University of Pennsylvania Press, 1992. Fulk, R. D. “Old English Meter and Oral Tradition: Three Issues Bearing on Poetic Chronology.” JEGP 106 (2007): 304–24. Fulk, R. D., and Cain, Christopher M.. A History of Old English Literature (2nd edn.). Oxford: Blackwell, 2013. Furrow, Melissa. “Radial Categories and the Central Romance.” Florilegium 22 (2005): 121–40. Galloway, Andrew. “Laʒamon’s Gift.” PMLA 121 (2006): 717–34. Galloway, Andrew. “Middle English Prologues.” In Readings, ed. Treharne, and Johnson, , pp. 288–305. Galloway, Andrew. The Penn Commentary on “Piers Plowman”: Volume 1. Philadelphia: University of Pennsylvania Press, 2006. Georgianna, Linda. “Periodization and Politics: The Case of the Missing Twelfth Century in English Literary History.” MLQ 64 (2003): 153–68. Gerritsen, Johan. “Leiden Revisited: Further Thoughts on the Text of the Leiden Riddle.” In Medieval Studies, ed. Bald, and Weinstock, , pp. 51–59. Glaser, Ben. [Review of Martin, Rise and Fall]. MLQ 74 (2013): 422–25. Godden, Malcolm. “Prologues and Epilogues in the Old English Pastoral Care, and their Carolingian Models.” JEGP 110 (2011): 441–73. Godden, Malcolm, and Lapidge, Michael, eds. The Cambridge Companion to Old English Literature (2nd edn.). Cambridge University Press, 2013. Goffart, Walter. “The Name ‘Merovingian’ and the Dating of Beowulf. ” ASE 36 (2007): 93–101. Gollancz, Israel. “The Middle Ages in the Lineage of English Poetry.” In Mediæval Contributions, ed. Hearnshaw, , pp. 174–89. Grady, Frank. “Piers Plowman, St. Erkenwald, and the Rule of Exceptional Salvations.” YLS 6 (1992): 63–86. Grady, Frank, and Galloway, Andrew, eds. Answerable Style: The Idea of the Literary in Medieval England. Columbus: Ohio State University Press, 2013. Gretsch, Mechthild. The Intellectual Foundations of the English Benedictine Reform. Cambridge University Press, 1999. Griffiths, Jane. “Editorial Glossing and Reader Resistance in a Copy of Robert Crowley’s Piers Plowman.” In Makers and Users, ed. Meale, and Pearsall, , pp. 202–13. Grindley, Carl James. “Reading Piers Plowman C-Text Annotations: Notes toward the Classification of Printed and Written Marginalia in Texts from the British Isles 1300–1641.” In Medieval Professional, ed. Kerby-Fulton, and Hilmo, , pp. 73–141. Hales, John W., and Furnivall, Frederick J., eds. Bishop Percy’s Folio Manuscript (3 vols.). London: Trübner, 1867–68. Hamilton, A. C. “Spenser and Langland.” SIP 55 (1958): 533–48. Hanford, James H., and Steadman, John M. Jr. “Death and Liffe: An Alliterative Poem.” SIP 15 (1918): 221–94. Hanna, Ralph. [Review of Cannon, Grounds]. Studies in the Age of Chaucer 28 (2006): 281–84. Hanna, Ralph. “Alliterative Poetry.” In Cambridge History, ed. Wallace, , pp. 488–512. Hanna, Ralph. “Defining Middle English Alliterative Poetry.” In Endless Knot, ed. Tavormina, and Yeager, , pp. 43–64. Hanna, Ralph, and Turville-Petre, Thorlac. “The Text of the Alliterative Morte Arthure: A Prolegomenon for a Future Edition.” In Robert Thornton, ed. Fein, and Johnston, , pp. 131–55. Hardison, O. B. Jr. “Crosscurrents in English Sixteenth-Century Prosody.” In Work of Dissimilitude, ed. Allen, and White, , pp. 116–30. Hardison, O. B. Jr. Prosody and Purpose in the English Renaissance. Baltimore: Johns Hopkins University Press, 1989. Hartman, Megan E. “The Limits of Conservative Composition in Old English Poetry.” In Dating, ed. Neidorf, , pp. 79–96. Hearnshaw, F. J. C., ed. Mediæval Contributions to Modern Civilisation: A Series of Lectures Delivered at King’s College University of London. London: Harrap & Co., 1921. Hickey, Raymond, and Puppel, Stanisław, eds. Language History and Linguistic Modelling: A Festschrift for Jack Fisiak on his 60th Birthday (2 vols.). Berlin: Mouton de Gruyter, 1997. Hill, Thomas D. “Beowulf and Conversion History.” In Dating, ed. Neidorf, , pp. 191–201. Hines, John. “The Benedicite Canticle in Old English Verse: An Early Runic Witness from Southern Lincolnshire.” Anglia 133 (2015): 257–77. Hoffman, Donald L. “‘Renischsche Renkes’ and ‘Runisch Sauez.’” N&Q 17 (1970): 447–49. Hogg, Richard. “Old English Palatalization.” Transactions of the Philological Society 77 (1979): 89–113. Horobin, Simon. “Stephan Batman and his Manuscripts of Piers Plowman.” RES 62 (2011): 358–72. Houwen, L. A. J. R., and MacDonald, A. A., eds. Loyal Letters: Studies on Mediaeval Alliterative Poetry and Prose. Groningen: Egbert Forsten, 1994. Howe, Nicholas. Migration and Mythmaking in Anglo-Saxon England. New Haven: Yale University Press, 1989. Howe, Nicholas. Writing the Map of Anglo-Saxon England: Essays in Cultural Geography. New Haven: Yale University Press, 2007. Hunt, R. W. “The Introductions to the ‘Artes’ in the Twelfth Century.” In Studia Mediaevalia, ed. students of Martin, Raymundi Josephi, pp. 85–112. James, Montague Rhodes. A Descriptive Catalogue of the Manuscripts in the Library of Lambeth Palace: The Mediaeval Manuscripts. Cambridge University Press, 1932. James, Montague Rhodes. A Descriptive Catalogue of the Manuscripts in the Library of Peterhouse. Cambridge University Press, 1899. Jansen, Sharon L. “Politics, Protest, and a New Piers Plowman Fragment: The Voice of the Past in Tudor England.” RES 40 (1989): 93–99. Jarvis, Simon. “For a Poetics of Verse.” PMLA 125 (2010): 931–35. Jarvis, Simon. “What Is Historical Poetics?” In Theory Aside, ed. Potts, and Stout, , pp. 97–116. Jefferson, Judith, and Putter, Ad. “Alliterative Metre and Editorial Practice: The Case of Death and Liffe.” In Approaches, ed. Jefferson, and Putter, , pp. 269–92. Jefferson, Judith, and Putter, Ad, eds. Approaches to the Metres of Alliterative Verse. Leeds: Leeds Studies in English, 2009. Johnson, Barbara A. Reading “Piers Plowman” and “The Pilgrim’s Progress”: Reception and the Protestant Reader. Carbondale and Edwardsville: Southern Illinois University Press, 1992. Jones, Chris. “Anglo-Saxonism in Nineteenth-Century Poetry.” LC 7 (2010): 358–69. Jones, Chris. “New Old English: The Place of Old English in Twentieth- and Twenty-First-Century Poetry.” LC 7 (2010): 1009–19. Jones, Chris. “Old English after 1066.” In Cambridge Companion, ed. Godden, and Lapidge, , pp. 313–30. Jones, Chris. Strange Likeness: The Use of Old English in Twentieth-Century Poetry. Oxford University Press, 2006. Kane, George. Chaucer and Langland: Historical and Textual Approaches. Berkeley and Los Angeles: University of California Press, 1989. Karkov, Catherine E., and Damico, Helen, eds. Aedificia Nova: Studies in Honor of Rosemary Cramp. Kalamazoo, MI: Medieval Institute, 2008. Keefer, Sarah Larrat, Jolly, Karen Louise, and Karkov, Catherine E., eds. Cross and Cruciform in the Anglo-Saxon World: Studies to Honor the Memory of Timothy Reuter. Morgantown: West Virginia University Press, 2010. Kelen, Sarah A. Langland’s Early Modern Identities. New York: Palgrave, 2007. Kelly, Stephen, and Thompson, John J., eds. Imagining the Book. Turnhout: Brepols, 2005. Kendall, Calvin B. The Metrical Grammar of “Beowulf”. Cambridge University Press, 1991. Kennedy, Edward Donald, Waldron, Ronald, and Wittig, Joseph S., eds. Medieval English Studies Presented to George Kane. Suffolk, England: St. Edmundsburg Press, 1988. Ker, N. R. A Catalogue of Manuscripts Containing Anglo-Saxon. Oxford University Press, 1957. Kerby-Fulton, Kathryn, and Hilmo, Maide, eds. The Medieval Professional Reader at Work: Evidence from Manuscripts of Chaucer, Langland, Kempe, and Gower. Victoria: ELS, 2001. King, John N. English Reformation Literature: The Tudor Origins of the Protestant Tradition. Princeton University Press, 1982. Kleist, Aaron J., ed. The Old English Homily: Precedent, Practice, and Appropriation. Turnhout: Brepols, 2007. Kooper, Erik. “Laʒamon and the Development of Early Middle English Alliterative Poetry.” In Loyal Letters, ed. Houwen, and MacDonald, , pp. 113–29. Kooper, Erik. “Laʒamon’s Prosody: Caligula and Otho – Metres Apart.” In Reading, ed. Allen, , Roberts, , and Weinberg, , pp. 419–41. Lapidge, Michael, and Gneuss, Helmut, eds. Learning and Literature in Anglo-Saxon England: Studies Presented to Peter Clemoes on the Occasion of his Sixty-Fifth Birthday. Cambridge University Press, 1985. Lavezzo, Kathy, ed. Imagining a Medieval English Nation. Minneapolis: University of Minnesota Press, 2004. Lawton, David. [Review of Cannon, Grounds]. Speculum 81 (2006): 820–21. Lawton, David. “The Diversity of Middle English Alliterative Poetry.” LSE 20 (1989): 143–72. Lawton, David. “Larger Patterns of Syntax in Middle English Unrhymed Alliterative Verse.” Neophilologus 64 (1980): 604–18. Lawton, David. “Literary History and Scholarly Fancy: The Date of Two Middle English Alliterative Poems.” Parergon 18 (1977): 17–25. Lawton, David. “The Unity of Middle English Alliterative Poetry.” Speculum 58 (1983): 72–94. Lee, Brian S., ed. An English Miscellany Presented to W. S. Mackie. Oxford University Press, 1977. Le Saux, Françoise. Layamon’s “Brut”: The Poem and its Sources. Cambridge: D. S. Brewer, 1989. Le Saux, Françoise, ed. The Text and Tradition of Layamon’s “Brut”. Cambridge: D. S. Brewer, 1994. Levy, Bernard S., and Szarmach, Paul E., eds. The Alliterative Tradition in the Fourteenth Century. Kent State University Press, 1981. Lockett, Leslie. “An Integrated Re-examination of the Dating of Oxford, Bodleian Library, Junius 11.” ASE 31 (2002): 141–73. Liu, Yin. “Middle English Romance as Prototype Genre.” CR 40 (2006): 335–53. Liuzza, Roy M. “The Old English Christ and Guthlac Texts, Manuscripts, and Critics.” RES 41 (1990): 1–11. Liuzza, Roy M. “On the Dating of Beowulf. ” In Beowulf Reader, ed. Baker, , pp. 281–302. MacDonald, A. A. “Alliterative Poetry and its Context: The Case of William Dunbar.” In Loyal Letters, ed. Houwen, and MacDonald, , pp. 261–79. Mancho, Guzmán. “Is Orrmulum’s Introduction an Instance of an Aristotelian Prologue?” Neophilologus 88 (2004): 477–92. Martin, Meredith. The Rise and Fall of Meter: Poetry and English National Culture, 1860–1930. Princeton University Press, 2012. Martin, R. J., students of, eds. Studia Mediaevalia in Honorem admodum Reverendi Patris Raymundi Josephi Martin. Bruges: De Tempel, 1948. Matonis, A. T. E. “Middle English Alliterative Poetry.” In So meny people, ed. Benskin, and Samuels, , pp. 341–54. McCabe, Richard A., ed. The Oxford Handbook of Edmund Spenser. Oxford University Press, 2010. McCulloh, John M. “Did Cynewulf Use a Martyrology? Reconsidering the Sources of The Fates of the Apostles. ” ASE 29 (2000): 67–83. McIntosh, Angus. 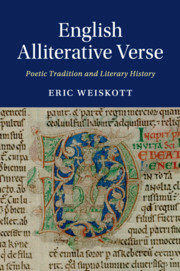 “Early Middle English Alliterative Verse.” In Middle English Alliterative Poetry, ed. Lawton, , pp. 20–33. McMullen, A. Joseph. “Forr þeʒʒre sawle need: The Ormulum, Vernacular Theology and a Tradition of Translation in Early England.” ES 95 (2014): 256–77. McTurk, Rory. Studies in “Ragnars saga loðbrókar” and its Major Scandinavian Analogues. Oxford: Society for the Study of Medieval Languages and Literature, 1991. Meale, Carol M., and Pearsall, Derek, eds. Makers and Users of Medieval Books: Essays in Honour of A. S. G. Edwards. Cambridge: D. S. Brewer, 2014. Meyvaert, Paul. “An Apocalypse Panel on the Ruthwell Cross.” In Medieval and Renaissance Studies, ed. Tirro, , pp. 3–32. Meyvaert, Paul. “Necessity Mother of Invention: A Fresh Look at the Rune Verses on the Ruthwell Cross.” ASE 41 (2012): 407–16. Middleton, Anne. “The Audience and Public of ‘Piers Plowman’.” In Middle English Alliterative Poetry, ed. Lawton, , pp. 101–23. Minkova, Donka. “Velars and Palatals in Old English Alliteration.” In Historical Linguistics, ed. Schmid, , Austin, , and Stein, , pp. 269–91. Minkova, Donka, and Stockwell, Robert P., eds. Studies in the History of the English Language: A Millennial Perspective. Berlin: Mouton de Gruyter, 2002. Minnis, A. J. “The Influence of Academic Prologues on the Prologues and Literary Attitudes of Late Medieval English Writers.” Mediaeval Studies 43 (1981): 342–83. Minnis, A. J. Medieval Theory of Authorship: Scholastic Literary Attitudes in the Later Middle Ages. London: Scolar Press, 1984. Momma, Haruko. The Composition of Old English Poetry. Cambridge University Press, 1997. Moorman, Charles. “The Origins of the Alliterative Revival.” Southern Quarterly 7 (1969): 345–71. Morgan, Chloe. “‘Lite bokes’ and ‘grete relikes’: Texts and their Transmission in the South English Legendary.” In Rethinking, ed. Blurton, and Wogan-Browne, , pp. 149–67. Morrison, Stephen. “Vernacular Literary Activity in Twelfth-Century England: Redressing the Balance.” In Culture politique, ed. Aurell, , pp. 253–67. Mossé, Ferdinand. “On the Chronology of French Loan-Words in English.” ES 25 (1943): 1–6, 33–40. Mueller, Alex. Translating Troy: Provincial Politics in Alliterative Romance. Columbus: Ohio State University Press, 2013. Myklebust, Nicholas. “Misreading English Meter: 1400–1514.” Diss., University of Texas at Austin, 2012. Neidorf, Leonard. “VII Æthelred and the Genesis of the Beowulf Manuscript.” Philological Quarterly 89 (2010): 119–39. Neidorf, Leonard. “Cain, Cam, Jutes, Giants, and the Textual Criticism of Beowulf.” SIP 112 (2015): 599–632. Neidorf, Leonard. “The Dating of Widsið and the Study of Germanic Antiquity.” Neophilologus 97 (2013): 165–83. Neidorf, Leonard. “Lexical Evidence for the Relative Chronology of Old English Poetry.” SELIM 20 (2013): 7–48. Neidorf, Leonard. “Scribal Errors of Proper Names in the Beowulf Manuscript.” ASE 42 (2013): 249–69. Neidorf, Leonard, ed. The Dating of “Beowulf”: A Reassessment. Cambridge: D. S. Brewer, 2014. Niles, John D. “Beowulf”: The Poem and its Tradition. Cambridge, MA: Harvard University Press, 1983. Niles, John D., ed. Old English Literature in Context: Ten Essays. Cambridge: D. S. Brewer, 1980. Norris, Ralph. Malory’s Library: The Sources of the “Morte Darthur”. Cambridge: D. S. Brewer, 2008. Oakden, J. P. Alliterative Poetry in Middle English: The Dialectal and Metrical Survey (2nd edn.). Hamden, CT: Archon, 1968. O’Brien O’Keeffe, Katherine, and Orchard, Andy, eds. Latin Learning and English Lore: Studies in Anglo-Saxon Literature for Michael Lapidge (2 vols.). University of Toronto Press, 2005. Ó Carragáin, Éamonn. “Sources or Analogues? Using Liturgical Evidence to Date The Dream of the Rood.” In Cross and Cruciform, ed. Keefer, , Jolly, , and Karkov, , pp. 135–65. Ó Carragáin, Éamonn. “Who Then Read the Ruthwell Poem in the Eighth Century?” In Aedificia Nova, ed. Karkov, and Damico, , pp. 43–75. O’Donnell, Daniel Paul. “Manuscript Variation in Multiple-Recension Old English Poetic Texts: The Technical Problem and Poetical Art.” Diss., Yale University, 1996. O’Donnell, Thomas. “The Old English Durham, the Historia de sancto Cuthberto, and the Unreformed in Late Anglo-Saxon Literature.” JEGP 113 (2014): 131–55. Okasha, Elisabeth. Hand-list of Anglo-Saxon Non-runic Inscriptions. Cambridge University Press, 1971. Orchard, Andy. “Old English and Latin Poetic Traditions.” In Blackwell Companion, ed. Saunders, , pp. 65–82. Orchard, Andy. “The Word Made Flesh: Christianity and Oral Culture in Anglo-Saxon Verse.” Oral Tradition 24 (2009): 293–318. Orton, Peter. “Deixis and the Untransferable Text: Anglo-Saxon Colophons, Verse-Prefaces and Inscriptions.” In Imagining, ed. Kelly, and Thompson, , pp. 195–207. Osberg, Richard H. “A Hand-List of Short Alliterating Metrical Poems in Middle English.” JEGP 80 (1981): 313–26. Otter, Monika. “‘New Werke’: St. Erkenwald, St. Albans, and the Medieval Sense of the Past.” Journal of Medieval and Renaissance Studies 24 (1994): 387–414. Page, Christopher. “A Catalogue and Bibliography of English Song from its Beginnings to c1300.” RMA Research Chronicle 13 (1976): 67–83. Page, R. I. An Introduction to English Runes. London: Methuen, 1973. Parkes, M. B. “The Manuscript of the Leiden Riddle.” ASE 1 (1972): 207–17. Parks, Ward. “The Traditional Narrator and the ‘I Heard’ Formulas in Old English Poetry.” ASE 16 (1987): 45–66. Pearsall, Derek. “The Alliterative Revival: Origins and Social Backgrounds.” In Middle English Alliterative Poetry, ed. Lawton, , pp. 34–53. Pearsall, Derek. Old English and Middle English Poetry. London: Routledge & Kegan Paul, 1977. Pearsall, Derek. “The Origins of the Alliterative Revival.” In Alliterative Tradition, ed. Levy, and Szarmach, , pp. 1–24. Pearsall, Derek, ed. Piers Plowman: A New Annotated Edition of the C-Text. University of Exeter Press, 2008. Perkins, Nicholas, ed. Medieval Romance and Material Culture. Cambridge: D. S. Brewer, 2015. Perry, Lucy. “Origins and Originality: Reading Lawman’s Brut and the Rejection of British Library MS Cotton Otho C.xiii.” Arthuriana 10 (2000): 66–84. Pickering, Oliver S. “An Early Middle English Verse Inscription from Shrewsbury.” Anglia 106 (1988): 411–14. Pollock, Sheldon. The Language of the Gods in the World of Men: Sanskrit, Culture, and Power in Premodern India. Berkeley: University of California Press, 2006. Pons-Sanz, S. M. “OE fēs(i)an / ME fēsen Revisited.” Neophilologus 90 (2006): 119–34. Potts, Jason, and Stout, Daniel, eds. Theory Aside. Durham, NC: Duke University Press, 2014. Prins, Yopie. “Historical Poetics, Dysprosody, and The Science of English Verse.” PMLA 123 (2008): 229–34. Pulsiano, Phillip. “The Prefatory Matter of London, British Library, Cotton Vitellius E. xviii.” In Anglo-Saxon Manuscripts, ed. Pulsiano, and Treharne, , pp. 85–116. Pulsiano, Phillip, and Treharne, Elaine, eds. Anglo-Saxon Manuscripts and their Heritage. Brookfield: Ashgate, 1998. Putter, Ad. “Adventures in the Bob-and-Wheel Tradition: Narratives and Manuscripts.” In Medieval Romance, ed. Perkins, , pp. 147–63. Putter, Ad, Jefferson, Judith, and Stokes, Myra. Studies in the Metre of Alliterative Verse. Oxford: Society for the Study of Medieval Languages and Literature, 2007. Reaney, P. H. “Notes on the Survival of Old English Personal Names in Middle English.” Studier i Modern Språkvetenskap 18 (1953): 84–112. Reaney, P. H., and Wilson, R. M.. A Dictionary of English Surnames (3rd edn.). London: Routledge, 1991. Reuter, Timothy, ed. Alfred the Great: Papers from the Eleventh-Century Centenary Conferences. Aldershot: Ashgate, 2003. Rhodes, Jim. Poetry Does Theology: Chaucer, Grosseteste, and the “Pearl”-Poet. University of Notre Dame Press, 2001. Richards, Mary P. “Old Wine in a New Bottle: Recycled Instructional Materials in Seasons for Fasting.” In Old English Homily, ed. Kleist, , pp. 345–64. Rigg, A. G. “Henry of Huntingdon’s Metrical Experiments.” Journal of Medieval Latin 1 (1991): 60–72. Robinson, Fred C. “Old English Literature in its Most Immediate Context.” In Old English Literature, ed. Niles, , pp. 11–29. Rosier, James L. “‘Instructions for Christians’: A Poem in Old English.” Anglia 82 (1964): 4–22. Rowland, Beryl, ed. Chaucer and Middle English Studies in Honour of Rossell Hope Robbins. London: Allen & Unwin, 1974. Russom, Geoffrey. “Constraints on Resolution in Beowulf.” In Prosody and Poetics, ed. Toswell, , pp. 147–63. Russom, Geoffrey. “Dating Criteria for Old English Poems.” In Studies, ed. Minkova, and Stockwell, , pp. 245–66. Russom, Geoffrey. “The Evolution of Middle English Alliterative Meter.” In Studies, ed. Curzan, and Emmons, , pp. 279–304. Russom, Geoffrey. “Some Unnoticed Constraints on the A-Verse in Sir Gawain and the Green Knight.” In Approaches, ed. Jefferson, and Putter, , pp. 41–57. Salter, Elizabeth. English and International: Studies in the Literature, Art, and Patronage of Medieval England. Cambridge University Press, 1988. Sandison, Helen Estabrook. The “Chanson D’Aventure” in Middle English. Bryn Mawr College, 1913. Sauer, Hans. “Knowledge of Old English in the Middle English Period?” In Language History, ed. Hickey, and Puppel, , vol. 1, pp. 791–814. Saunders, Corinne, ed. A Blackwell Companion to Medieval Poetry. Oxford: Blackwell, 2010. Scase, Wendy. “Dauy Dycars Dreame and Robert Crowley’s Prints of Piers Plowman. ” YLS 21 (2007): 171–98. Scase, Wendy. “Latin Composition Lessons, Piers Plowman, and the Piers Plowman Tradition.” In Answerable Style, ed. Grady, and Galloway, , pp. 34–53. Scattergood, John. The Lost Tradition: Essays on Middle English Alliterative Poetry. Dublin: Four Courts, 2000. Schiff, Randy P. Revivalist Fantasy: Alliterative Verse and Nationalist Literary History. Columbus: Ohio State University Press, 2011. Schmid, Monka, Austin, Jennifer, and Stein, Dieter, eds. Historical Linguistics 1997. Amsterdam: Johns Benjamin, 1998. Schröer, Arnold. “The Grave.” Anglia 5 (1882): 289–90. Schustereder, Stefan. “Coming to Terms with a Pagan Past: The Story of St Erkenwald.” Studia Anglica Posnaniensia 48 (2013): 71–92. Shippey, Tom. “The Merov(ich)ingian Again: damnatio memoriae and the usus scholarum.” In Latin Learning, ed. O’Brien O’Keeffe, and Orchard, , vol. 1, pp. 389–406. Shippey, Tom. “Names in Beowulf and Anglo-Saxon England.” In Dating, ed. Neidorf, , pp. 58–78. Sievers, Eduard. Altgermanische Metrik. Halle: Niemeyer, 1893. Simpson, James. [Review of Scattergood, Lost Tradition]. RES 53 (2002): 109–11. Singh, Catherine. “The Alliterative Ancestry of Dunbar’s ‘The Tretis of the Tua Mariit Wemen and the Wedo.’” LSE 7 (1974): 22–54. Sisam, Kenneth. Studies in the History of Old English Literature. Oxford: Clarendon Press, 1953. Sisk, Jennifer L. “The Uneasy Orthodoxy of St. Erkenwald. ” ELH 74 (2007): 89–115. Skeat, W. W. “An Essay on Alliterative Poetry.” In Bishop Percy’s Folio, ed. Hales, and Furnivall, , vol. 3, pp. xi–xxxix. Stanley, Eric Gerald. A Collection of Papers with Emphasis on Old English. Toronto: Pontifical Institute of Mediaeval Studies, 1987. Stanley, Eric Gerald. “The Date of Laʒamon’s Brut. ” N&Q 213 (1968): 85–8. Stanley, Eric Gerald. “Laʒamon’s Antiquarian Sentiments.” MÆ 38 (1969): 23–37. Stanley, Eric Gerald. “Laʒamon’s Un-Anglo-Saxon Syntax.” In Text and Tradition, ed. Saux, Le, pp. 47–56. Stanley, Eric Gerald. “The Scansion of Laʒamon’s Brut: A Historical Sketch.” N&Q 56 (2009): 175–86. Stinson, Timothy. “The Rise of English Printing and Decline of Alliterative Verse.” YLS 22 (2008): 165–97. Suzuki, Seiichi. The Metrical Organization of “Beowulf”: Prototype and Isomorphism. Berlin: Mouton de Gruyter, 1996. Swan, Mary, and Treharne, Elaine, eds. Rewriting Old English in the Twelfth Century. Cambridge University Press, 2000. Tavormina, M. Teresa, and Yeager, R. F., eds. The Endless Knot: Essays on Old and Middle English in Honor of Marie Borroff. Cambridge: D. S. Brewer, 1995. Thornbury, Emily V. Becoming a Poet in Anglo-Saxon England. Cambridge University Press, 2014. Tiller, Kenneth. “Anglo-Norman Historiography and Henry of Huntingdon’s Translation of The Battle of Brunanburh. ” SIP 109 (2012): 173–91. Tiller, Kenneth. “Romancing History: Masculine Identity and Historical Authority in Laʒamon’s Prologue (Cotton MS Caligula A. ix ll. 1–35).” In Laʒamon, ed. Allen, , Perry, , and Roberts, , pp. 371–83. Tirro, Frank, ed. Medieval and Renaissance Studies 9: Proceedings of the Southeastern Institute of Medieval and Renaissance Studies, Summer, 1978. Durham, NC: Duke University Press, 1982. Tolkien, J. R. R. “Beowulf: The Monsters and the Critics.” Proceedings of the British Academy 22 (1936): 245–95. Toswell, M. J., ed. Prosody and Poetics in the Early Middle Ages: Essays in Honour of C. B. Hieatt. University of Toronto Press, 1995. Treharne, Elaine. “Categorization, Periodization: The Silence of (the) English in the Twelfth Century.” New Medieval Literatures 8 (2006): 247–73. Treharne, Elaine. Living through Conquest: The Politics of Early English, 1020–1220. Oxford University Press, 2012. Treharne, Elaine. “Reading from the Margins: The Uses of Old English Homiletic Manuscripts in the Post-Conquest Period.” In Beatus vir, ed. Doane, and Wolf, , pp. 329–58. Treharne, Elaine, and Johnson, David, eds. Readings in Medieval Texts: Interpreting Old and Middle English Literature. Oxford University Press, 2005. Trilling, Renée R. The Aesthetics of Nostalgia: Historical Representation in Old English Verse. University of Toronto Press, 2009. Turville-Petre, Thorlac. “Afterword: The Brutus Prologue to Sir Gawain and the Green Knight.” In Imagining, ed. Lavezzo, , pp. 340–46. Turville-Petre, Thorlac. The Alliterative Revival. Cambridge: D. S. Brewer, 1977. Turville-Petre, Thorlac. “The Prologue of Wynnere and Wastoure.” LSE 18 (1987): 19–29. Turville-Petre, Thorlac. “‘Summer Sunday’, ‘De Tribus Regibus Mortuis’, and ‘The Awntyrs off Arthure’: Three Poems in the Thirteen-Line Stanza.” RES 25 (1974): 1–14. Turville-Petre, Thorlac. “Wynnere and Wastoure: When and Where?” In Loyal Letters, ed. Houwen, and MacDonald, , pp. 155–66. Tyler, Elizabeth M. Old English Poetics: The Aesthetics of the Familiar in Anglo-Saxon England. York Medieval Press, 2006. Waldron, Ronald. “Trevisa’s Original Prefaces on Translation: A Critical Edition.” In Medieval English, ed. Kennedy, , Waldron, , and Wittig, , pp. 285–99. Wallace, David, ed. The Cambridge History of Medieval English Literature. Cambridge University Press, 1999. Warner, Lawrence. The Myth of “Piers Plowman”: Constructing a Medieval Literary Archive. Cambridge University Press, 2014. Warren, Michelle R. History on the Edge: Excalibur and the Borders of Britain, 1100–1300. Minneapolis: University of Minnesota Press, 2000. Watson, Jonathan. “The Minim-istic Imagination: Scribal Invention and the Word in the Early English Alliterative Tradition.” Oral Tradition 17 (2002): 290–309. Watson, Nicholas. “The Politics of Middle English Writing.” In Idea, ed. Wogan-Browne, et al., pp. 331–52. Weiskott, Eric. “Alliterative Meter after 1450: The Vision of William Banastre.” In Early English Poetic Culture and Metre: The Influence of G. R. Russom, ed. Brady, Lindy and Toswell, M. J.. Kalamazoo, MI: Medieval Institute, in press. Weiskott, Eric. “Alliterative Meter and English Literary History, 1700–2000.” ELH, in press. Weiskott, Eric. “Before Prosody: Early English Poetics in Practice and Theory.” MLQ, in press. Weiskott, Eric. “The Ireland Prophecy: Text and Metrical Context.” SIP, in press. Weiskott, Eric. “The Meter of Widsith and the Distant Past.” Neophilologus 99 (2015): 143–50. Weiskott, Eric. “Phantom Syllables in the English Alliterative Tradition.” MP 110 (2013): 441–58. Weiskott, Eric. “Piers Plowman and the Durable Alliterative Tradition.” YLS, in press. Weiskott, Eric. “Prophetic Piers Plowman: New Sixteenth-Century Excerpts.” RES 67 (2016): 21–41. Weiskott, Eric. “A Semantic Replacement for Kaluza’s Law in Beowulf. ” ES 93 (2012): 891–96. Weiskott, Eric. “Three Beowulf Cruces: healgamen, fremu, Sigemunde.” N&Q 58 (2011): 3–7. Weiskott, Eric. “Three-Position Verses in Beowulf. ” N&Q 60 (2013): 483–85. Weldon, James F. G. “The Structure of Dream Visions in Piers Plowman.” Mediaeval Studies 49 (1987): 254–81. Whitelock, D[orothy]. “Anglo-Saxon Poetry and the Historian.” Transactions of the Royal Historical Society 31 (1949): 75–94. Whitelock, D[orothy]. The Audience of “Beowulf”. Oxford: Clarendon Press, 1951. Wilson, R. M. The Lost Literature of Medieval England. London: Methuen, 1952, repr. 1970. Wogan-Browne, Jocelyn. “Locating Saints’ Lives and their Communities.” In Rethinking, ed. Blurton, and Wogan-Browne, , pp. 251–70. Wogan-Browne, Jocelyn, Watson, Nicholas, Taylor, Andrew, and Evans, Ruth, eds. The Idea of the Vernacular: An Anthology of Middle English Literary Theory, 1280–1520. University Park: Pennsylvania State University Press, 1999. Wormald, Patrick. The Times of Bede: Studies in Early English Christian Society and its Historian, ed. Baxter, Stephen. Oxford: Blackwell, 2006. Wrenn, C. L. “On the Continuity of English Poetry.” Anglia 76 (1958): 41–59. Wymer, Kathryn. “A Poetic Fragment on the Soul’s Address to the Body in the Trinity Homilies. ” N&Q 55 (2008): 399–400. Yakovlev, Nicolay. “The Development of Alliterative Metre from Old to Middle English.” Diss., University of Oxford, 2008. Yakovlev, Nicolay. “Metre and Punctuation in the Caligula Manuscript of Laʒamon’s Brut.” In Use and Development, ed. Dance, and Wright, , pp. 261–79. Yeager, Stephen. From Lawmen to Plowmen: Anglo-Saxon Legal Traditions and the School of Langland. University of Toronto Press, 2014. Zeeman, Nicolette. “Tales of Piers and Perceval: Piers Plowman and the Grail Romances.” YLS 22 (2008): 199–236.